Potosi senior Ben Turnbough executes a takedown against Chance Richards of Moberly during the MSHSAA 195-pound Class 2 title match Saturday, Feb. 17, 2018, at Mizzou Arena. A 6-0 decision gave Turnbough a perfect 41-0 record as he became the first state champion in the history of the Potosi program. 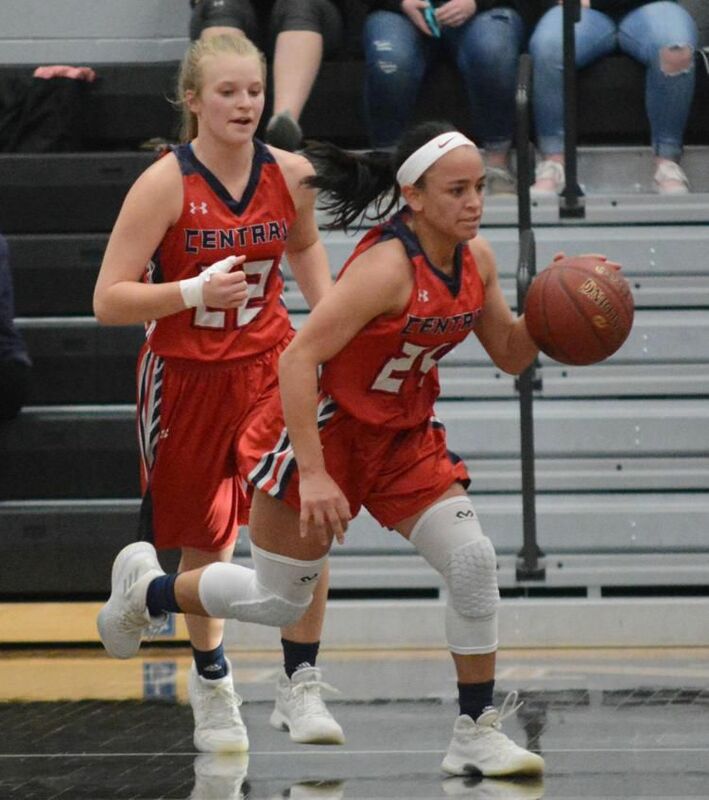 Skyler Amonette (24), Callie Thurston (22) and the Central girls basketball team rattled off 19 consecutive wins between December and February, earning MAAA conference and Central Christmas Tournament titles along the way. North County basketball star Hayden Sprenkel capped his varsity career with 2,279 career points to finish second all-time among boys in the MAAA Conference. Editor’s Note: This is the second article in a multi-part series highlighting notable events and achievements by local athletes and teams during the 2017-18 scholastic sports year. The best high school wrestlers across the state gather each February with the hope of competing on day three of the state tournament with a guaranteed spot on the medals stand. But for two local standouts – Ben Turnbough of Potosi and Wade Hahn of Ste. Genevieve – the weekend showcase meant a confrontation with unfinished business that was one year in the making. Turnbough suffered the only loss of his junior season, and saw an individual state title slip through his grasp in the closing seconds of the championship bout. He worked even harder as a senior to conquer that haunting outcome, and was rewarded with a perfect 41-0 season as the undisputed king of the 195-pound weight division in Class 2. Turnbough posted a 6-0 decision to become the first state champion in the 5-year history of the revived Potosi program, and did not surrender a point in four matches at Mizzou Arena. Hahn followed a bumpy path to the same destination at 182 pounds as a serious shoulder injury limited him to just 15 matches during the season. But the senior would rally for a momentous overtime victory in the same semifinal round where he was defeated one year earlier, and locked up his own state crown with another 4-2 decision. Ste. Genevieve qualified 10 athletes for the tournament. Heavyweight runner-up Isaac Boyd, Tyler Hale, Jared Humbolt and Nathan Geisner gave the Dragons five state medalist in total. Central freshman Kade Willis finished fifth at 126 pounds in Class 2, while Farmington senior Dylan Allen improved to sixth at 160 pounds in Class 3. Ste. Genevieve earned a 13th district championship in 14 years, a feat that was highlighted when Jacob Dickens and Humbolt won each of their four contests by fall. Turnbough was voted the Most Outstanding Wrestler at the SEMO conference event that included 16 schools and saw Ste. Genevieve take second in the standings. Boyd pinned five straight opponents while joining Humbolt and Dickens and individual champs. Mike Allison of North County did likewise along with Ian Asher and Allen of Farmington. Central abandoned the duals format for its early-January tournament. Among the bracket winners were Cole Cresswell and Allison for the Raiders plus Turnbough and Noah Juliette for Potosi. Dalton Berg was another mat standout for the Knights, earning titles at the Class 3, District 1 and always loaded Neosho tournament fields. District upsets and the sudden departure of skilled senior classes created a whirlwind of emotions for several teams during the girls basketball season. Two games in particular registered especially high on the drama barometer, while another turned into an unexpected rout. But all showed the visible sadness of finality. Farmington carried the top seed at home in Class 4, District 2, and rolled to the final with an experience edge against familiar foe North County. But an effort of 25 points and 13 rebounds from all-state sophomore Kayleigh Winch helped the Lady Raiders prevail 51-48 while trailing for only 14 seconds of the contest. North County went on to be shellacked by Dexter in the sectional round, but established bright future prospects with its entire starting lineup poised to return next this winter. Cuba High School hosted Class 3, District 3, and was filled well beyond capacity for a riveting rematch of the Central Christmas Tournament between Central and Steelville. The Lady Cardinals saw a 12-point lead disappear as Central rallied from a miserable start behind its aggressive defense, but prevailed 46-42 to score their first district title in program history. Steelville had attempted to unseat the Lady Rebels at the Central Christmas Tournament, and wasted numerous chances to put the contest away. A memorable night for two-time all-state guard Skyler Amonette willed Central to a 79-68 triumph in double overtime and a fifth straight home tourney championship. Amonette drilled a pull-up 3-pointer just before time expired in regulation, and paced a comeback once her squad fell behind by seven points in overtime. She scored a career-best 32 points that night while reaching 1,000 as a varsity player. Teammate Caitlyn Holmes achieved that same plateau a few weeks later for the Lady Rebels. Central wrapped up the outright MAAA Large-School title amid a 19-game win streak, and worked past Farmington in the conference tournament final 48-39. The Lady Rebels did not surrender a single free-throw attempt to the Knights in two separate encounters during the season. Arcadia Valley continued its dominance of the Small-School division, extending its regular season win streak to 30 in conference games while notching a sixth straight title. The Lady Tigers avenged a 19-point loss to North County during the league tourney, and eventually fell to Saxony Lutheran in a district final for the fifth consecutive year. Valley hoped to earn a spot against Class 1, District 3 juggernaut South Iron, but was rattled instead by Viburnum 66-44 after winning two previous meetings against the Lady Jays. Senior guard Lexie Black became the career scoring leader for the Lady Vikings at 1,714 points in her tearful final varsity game, hitting a milestone 3-pointer in the fourth quarter. The same teams engaged in a wild contest on Dec. 12 that Valley claimed 85-83. Madison Lucas netted 40 points in the win, while Kinsley Payne of Viburnum dropped in an incredible 55. Valle Catholic also saw its all-time scoring mark change hands when Sydni Basler passed the total of 1,565 by cousin and former Indians State guard Kara Schilli in a road loss at AV. Basler and the Lady Warriors would stop a 13-year drought against cross-town rival Ste. Genevieve with a 61-58 triumph in the MAAA tournament. West County enjoyed an 8-game win streak during its season. Head coach Chris Brewer stepped down to accept an administrative position at North County, and amassed 206 wins over 14 years. Lone senior Alyssa Roever scored 31 points for the Lady Bulldogs on 5-of-5 shooting from beyond the arc during a decisive victory over winless Bismarck. While Lucas had the highest single-game point total among MAAA girls with 40, Winch compiled 30 on several occasions for North County, including a season-high 37 against the St. Louis Patriettes. Nobody illuminated the scoreboard lights last winter quite like North County star Hayden Sprenkel, who made the Class 4 all-state squad after averaging nearly 26 points per game. Sprenkel ended his varsity career as the second-leading scorer in the MAAA with 2,279 points, and had already owned the all-time number at North County as a junior. He surpassed the 2,000 plateau in a home win against Potosi, and buried 12 3-point shots while tallying a career-high 44 against Perryville. But perhaps his proudest honor was a team achievement. The Raiders broke through against Farmington 65-51 at home after dropping 14 in a row to their rivals. A controversial 1-point loss at the Central Christmas Tournament made the win even more satisfying. Farmington would gain revenge, however, by eliminating the Raiders in a district semifinal. The Knights also captured the MAAA tournament crown over Large-School champion Central, and proved regional prowess in victories over Jackson and Poplar Bluff. Hillsboro blocked Farmington from a district title for the second straight year. The Hawks did the same at the Central tournament before the Knights turned the tables in their regular-season finale. The Rebels knocked off Farmington 60-57 on back-to-back threes by Wade Scherffius and Brent Wagner during a crucial Jan. 19 clash at T.J. Foulon Fieldhouse, and also took down North County in conference play after squandering a 20-point lead to the Raiders at the Christmas Tournmaent. Central was the lone boys team from the MAAA to visit the state playoffs after rolling past West County and Steelville for the Class 3, District 3 title. The Rebels grabbed a 30-28 halftime in the sectional round against Whitfield, but lost steam as Missouri signee Torrence Watson exploded for 44 points and 10 rebounds in a 63-49 outcome. Central lost its season opener on a buzzer beater against Festus, and West County prolonged its season with a thrilling 70-69 district first-round win over St. Pius as Nate Kinnard just before time expired. The Bulldogs claimed the Small-School division crown at 5-0, including tight wins over Valle Catholic and Arcadia Valley. The Warriors would answer with an overtime triumph in MAAA tourney. The season began with a slice of history at the oldest continuous tournament in Missouri as Lesterville upset West County and South Iron to claim the Arcadia Valley Thanksgiving trophy for the first time since 1966. Lesterville soon climbed into the Class 1 poll, but was on the receiving end of a landmark effort at Mineral Area College by Kingston, which shot 67 percent during the second half to prevail 57-55 and notch its first victory ever against a state-ranked opponent. Five MAAA boys joined Sprenkel and Hardy in the 1,000-point club. Gabe Greminger of Ste. Genevieve was the first, while Hunter Drake of Bismarck, Tycen Gray of Farmington, Noah Jacobsen of Potosi and Scherffius of Central followed suit.